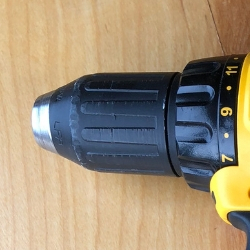 The first tool we need to talk about is the portable electric drill. I personally can’t even imagine trying to accomplish any project in woodworking or home repair without a good quality electric hand drill. A drill is absolutely invaluable and is the most widely sold and used power-tool on the market. There is a tremendous range of tools from ultra-cheap almost disposable drills to extremely expensive and massively powerful professional drills. Hammer Drills...Do you need one? a keyless chuck will save many hours over the life of your tool because of the speed at which you can change bits without using the old chuck key (not to mention searching for the chuck key when it is misplaced or lost outdoors). These battery powered tools have almost taken over the market in recent years. They are extremely convenient, but you will pay more for a cordless drill than you will for a corded drill with the same features. 2. you won’t need an extension cord. 3. often it is easier to operate as slow speeds i.e. as a power screwdriver. 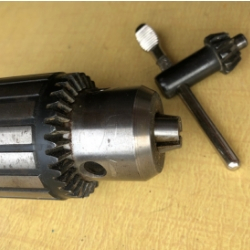 1. drills are heavier because of the battery weight. 2. they are more expensive than corded drills. 3. you must keep the batteries charged. These amazing tools have been the standard since the portable drills invention by brothers Wilhelm & Carl Fein of Stuttgart, Germany in 1895. For doing heavy work with your drill the corded drill can’t be beaten. you do not have to remember to charge the batteries. 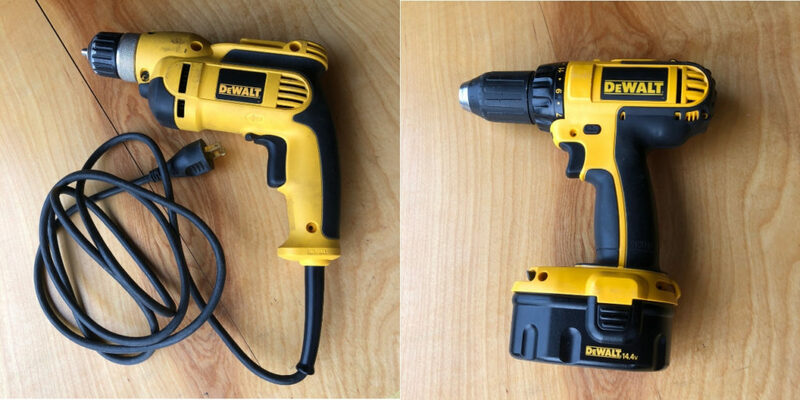 a corded drill is more powerful and more consistent than a battery powered drill. can operate at higher RPM for longer periods of time. you will need to operate near to a power outlet. you will definitely need a proper extension cord on hand. they can be difficult to control at low speeds i.e. for driving screws. I’m often asked if a person needs a hammer drill. 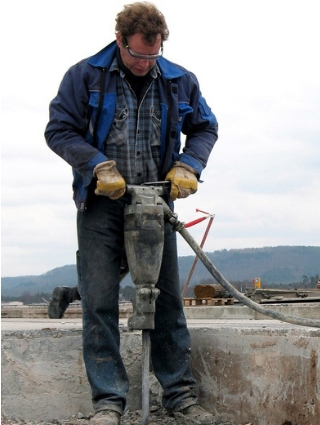 Hammer drills are essential for any drilling in concrete or masonry. Trying to drill in concrete with a standard Power drill and a masonry bit can be almost impossible. The hammer action in the electric drill is a vibrating mechanical impact that feels like buzzing as you apply pressure to the drill against the masonry etc… it works like a miniature jack-hammer. If you live in a home with cinderblock or concrete walls, stucco, brick or tile, then the purchase of a drill with hammer feature will be a very good idea. Both Cordless and Corded drills can be purchased with the hammer drill feature. There is a vast selection of drills to meet almost every project need with a different size and model of cordless or corded drill. When driving screws I prefer a Cordless drill because the variability of speed and the torque control settings make driving screws much easier. When I am drilling multiple holes or using the drill with a grinding or buffing attachment then the Corded drill wins my vote. think of every project in your home that needs a hole drilled and a screw installed. Choose the drill that makes the most sense for you now... as your skills develop you will undoubtedly feel the need to have at least a couple of drills on hand. Have fun shopping for your first electric hand drill! I’m sure you will soon agree with me that it is one of the most valuable tools in your toolset. There's more information about woodworking at https://howtogetstartedwoodworking.com/blog/ ‎. Please let me know about your personal drill preferences or experience in the comments section. Good information. I have both cordless and battery drills. The thing I don’t like about the battery ones is…seems when you need it the battery is always not charged and ya have to wait on it! And the batteries don’t last long so you are always having to buy replacements and they are expensive. It’s cheaper to buy a new drill! Thanks for the info! Thanks Susan! I agree with you. I do end up buying new drills whenever my batteries give out. I appreciate the comment! I like this web blog very much, Its a really nice situation to read and incur info . “Education is the best provision for old age.” by Aristotle. I agree, we can never stop learning!